Are you looking for the best dog food for Huskies? Huskies are really active dogs who love playing around. And, it’s really important that you give them the right amount and quality of food for them to be happy and healthy. Did you know that Huskies eat a little less food as compared to other large dogs? Well, it’s true and is because of their roots. Don’t panic if your Husky doesn’t feel like eating now and again. But, you do need to take care of your doggy’s nutrition. In fact, according to the National Research Council of the National Academies a 50-pound Husky needs around 1350 kcals in his diet. You need to feed your doggy friend the right balance of protein, carbs, and fats! In order to know what’s the best food for Huskies, we also need to know the quantity of meat, the macros and the quality of ingredients. Let’s review the top 5 picks for the best dog food for Huskies. I’ll talk more about Husky food, but a little later. You need to be patient, my friend. How Often Should I Be Feeding My Doggy? Now, before we go into the best dog food for Husky, we should talk about how much we should feed them. Huskies are an active breed. But, they don’t eat a lot of food. Well, rather than just filling a bowl and finding it half eaten at the end of the day, you should instead feed your furry friend throughout the day. No, I’m not saying that you spoon-feed your husky! But, before all that, call up your vet and ask him how much you should be feeding your doggy friend! By refilling his bowl thrice a day without having any ideas as to the number of calories you should be feeding your doggy friend can make your dog overweight! Always keep in mind your doggy’s activity level and weight to estimate how much you should be feeding him! I hope I made that clear. We can’t talk about Husky food without talking about Zinc. Now, you must be wondering why an element in the periodic table has to do with your doggy friend. Zinc is one of the vitamins and minerals that our bodies (and your dog’s!) need. But, why is zinc important for a Husky? Well, that’s simply because Huskies as a breed are prone to a condition named zinc responsive dermatosis. What this condition does is that it thickens and scales the dog’s skin which happens either due to the decrease in the absorption of zinc or a zinc-deficient diet. The symptoms include hair loss, lesions, dull hair and bacterial infections in the dog. Apart from just the syndrome, zinc also plays a big role in the immune system, skin, and hair health and reproductive system. So, what I’m basically boiling down to is that you should really keep an eye on our dog’s intake of zinc and even try to add some zinc supplements in his diet. After all, you know what the say, right? Before I talk about the best dog food for Huskier, I’d also like to get into a few things that you should consider before you go feed your doggy just about anything. After all, your dog’s health is our first priority! This is one thing that you should write somewhere. This is really important. No matter what you do, never ever, in your entire life give your Husky cooked bones. That’s because bones tend to splinter and lodge in the throat. Instead, invest in some good chew sticks! You may have found the best dog food for Huskies, but don’t make an immediate and abrupt transition to the different food! This change can be very stressful for your doggy friend! What you should be doing is gradually introducing the new food to your doggy’s diet. Start by mixing half a cup if the new dog food to your dog’s old food and work your way up. In today’s busy lifestyle, it can be really hard to stop for a minute and research dog foods. I get that you want to take better care of your doggy friend, it just can’t spare the time. Don’t worry, I’ll help you out! Today, I’ve got a list of the best dog food for husky puppies just for you. Here’s a quick overview of the Best Dog Food for Huskies. As I said earlier, you need to check not one, but three things in order to pick out the best dog food for Huskies. So, I’ve only picked out the best Husky food on my list. Don’t worry about anything, leave it up to me! Let’s talk about the 5 High-Quality Options for Huskies, shall we? Taste of Wild Canine Formula is known to be one of the best food for Huskies. It has an above-average amount of protein and moderate carbs which makes it one of the best Husky foods available. Your little Husky would love this! Let’s find out more about the Taste of Wild, Canine Formula, shall we? Don’t worry! I’ve got you covered! I’ll explain this in simpler terms. When we compare Taste of Wild to any average dry dog food, it contains above-average levels protein and fat. It contains below-average amounts of carbs, making this a good Husky food. I’m pretty sure that your Husky would love this yummy and nutritious formula! When we try to single out the amount of protein in flaxseed, garbanzo beans, yeast, and peas, it still has a moderate amount of meat in it. Now, that’s something really good! I feel that this one gives you the best deal, and a lot of Husky owners can back me up on this! 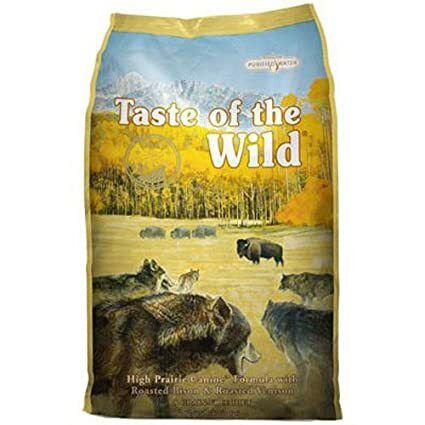 All in all, I feel that the Taste of the Wild is an amazing plant-based dog food as it contains moderate quantities of named meats and good-quality ingredients. If you judge Wellness CORE Dog food by just its ingredients, this is definitely an above-average dog food. And, it is also one of the best cheap dog foods that are easy on your wallet and high-quality. Let’s talk about the macronutrients as well, shall we? Are you confused as to what these numbers mean? Well, I’ll help you out with that! Don’t worry! Well, as you can see by these numbers, Wellness CORE Natural Dog food has an above-average amount of protein, an average amount of fat, and below average amount carbohydrates when you compare it to other dog foods. But, don’t base your judgment on just that! We need to talk about the quantity of meat in the food as well! 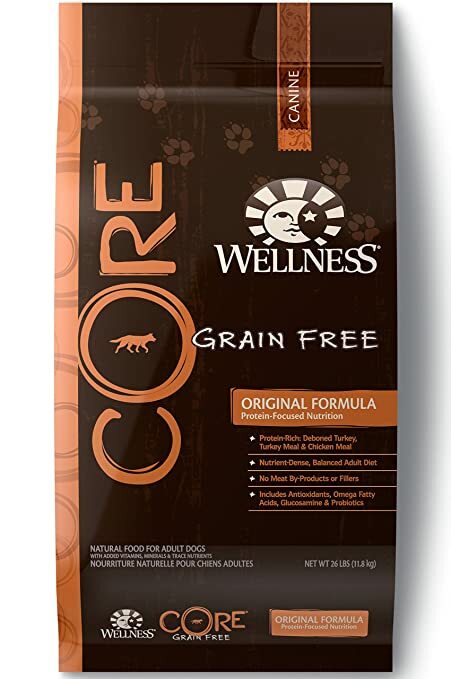 So, when you try to single out the amount of protein in legumes and flaxseed, Wellness CORE Natural dog food still has a significant amount of meat in it. Now, isn’t that just amazing! Let’s talk about the pros and cons, shall we? 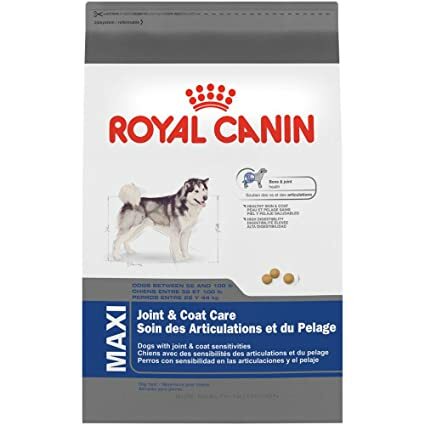 If you just judge the Royal Canin Size Health Nutrition dog food just by its ingredients, then this will come out to be a below-average kibble. But, let’s not judge a dog food just by its ingredients. I’ll tell you why I’ve got this on my list of the best dog food for Huskies. Let’s talk about the macros, shall we? Well, the kibble contains below-average amounts of protein, carbs as well as fats. This one’s best for the senior Huskies who aren’t very active. When you single out the protein in corn and wheat gluten, and grain distillers, Royal Canin Size Health Nutrition still has a moderate amount of meat in it. I really feel that this is one of the best dog food for Huskies. What about you? I feel that the Wilderness Blue Buffalo is a great choice for your little Husky. Don’t worry, I’ll talk this one out in great detail. Are you ready? Let’s talk about the macros! Confused as to what these numbers even mean? Well, I’ll help you out. The numbers simply mean that Wilderness Blue Buffalo dog food contains a near-average amount of fat, an above average amount of protein, but a below-average amount of carbs. This basically means that this dog food is probably best for inactive or senior dogs as well. But, that’s not all, folks! If you weigh the protein content in quinoa, peas, alfalfa, pea protein, and chia seed this dog food still contains a notable amount of meat! This one also contains a notable amount of meat in it, making it a great choice. So, I really feel that this is one of the best dog food for husky puppies! 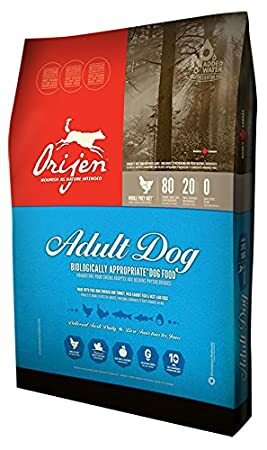 I feel that Orijen Adult Dog Food is also one of the best dog food for Huskies. Let’s talk in detail, shall we? The stats simply suggest that the food has above-average levels of protein and fat, and a below-average amount of carbohydrates when compared to other dog foods. But, what about the meat content? As you can tell by the amount of protein, this kibble contains a significant amount of meat in it when you compare it to other dog foods. A significant amount of meat means that the dog will love this food! 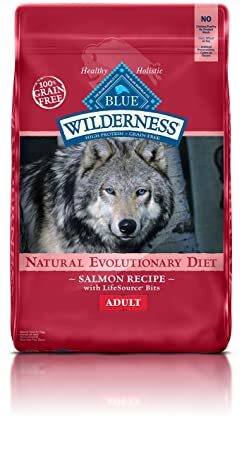 All in all, I really feel that this one deserves to be on my list of the best dog food for Huskies. The Bottom Line: What’s The Best Dog Food for Huskies? Huskies are an active breed and need different nutrition than a normal dog would. You need to keep in mind that Huskies are grazers and don’t like to eat entire meals. So, make sure you feed them throughout the day. I really hope that this article helped you out in finding the best dog food for Huskies. Do leave a comment if you’ve got any question or suggestions!